With Father’s Day fast approaching, it’s time to plan the perfect day for your Pops. Lucky for you, there are plenty of Dad-approved activities to choose from on the Central Coast. After you’ve given him a Martin Resorts eGift card, celebrate with a day of beer tasting, a mouth-watering steak dinner, or a round of golf at one of the many beautiful golf courses located in sunny San Luis Obispo County. When you see the smile on your Father’s face as he winds up for a swing, you’ll know your Father’s Day celebration is a hole-in-one! Below, discover some of our favorite greens to putt around on this weekend. Nestled on the South end of iconic Morro Bay, Sea Pines Golf Resort calls the charming town of Los Osos home. This quiet coastal community serves as the gateway to stunning Montaña de Oro State Park, which is known as one of the most spectacular stretches of coastline on the West Coast. As you and Dad enjoy their 9-hole executive course, breathe in the fresh ocean air and take in expansive views of the surrounding grand old pine, cypress, and eucalyptus trees. A hotel, golf course, and restaurant all rolled into one, Sea Pines offers golf lessons, stay & play packages, foot golf, disc golf, and junior golf, so golfers of all levels are sure to find something they love! If you need extra practice, take advantage of their driving range and practice areas, which are equipped with two putting greens and a chipping area to help you perfect your swing. Sea Pines also serves as the home base for the Central Coast Golf Trail, centrally located within an easy drive to all 11 courses on the trail from Paso Robles to Nipomo. From tee to green, Sea Pines Golf Resort’s natural beauty and abundance of fun activities will make you want to come play again and again. If you find yourself on a family vacation this Father’s Day at one of Martin Resorts‘ oceanfront properties, a 9-hole round of golf might be too much for the little ones. Or, maybe you want to work on your stroke before hitting the real green. 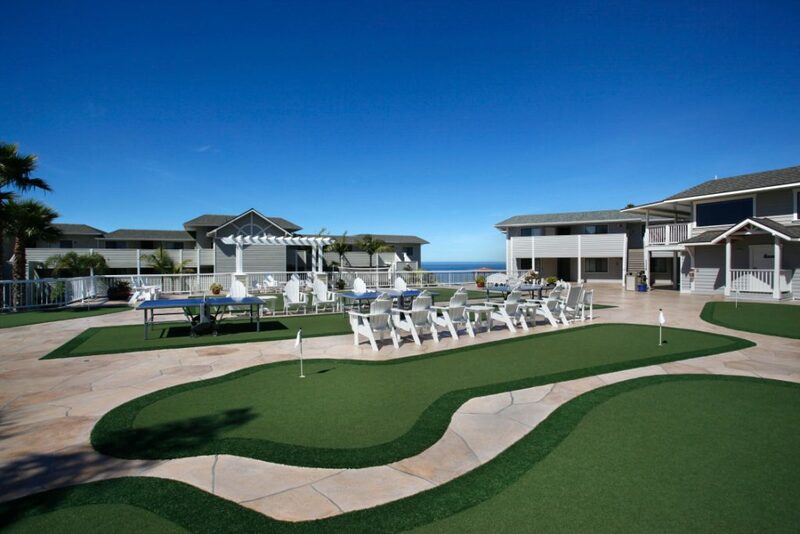 At both Avila Lighthouse Suites and Pismo Lighthouse Suites, their onsite putting greens are the perfect place to squeeze in some golf during your stay. After tee time is up, have fun exploring the other deck activities. At Pismo Lighthouse Suites, Dad can play like a kid again with badminton or a game of life-size chess on the sunny play deck. Surrounded by century-old oak trees, natural lakes, and beautiful vistas of Paso Robles wine country, Hunter Ranch Golf Course is a North County golfer’s delight. With an 18-hole Championship course, Hunter Ranch offers small town charm and world-class golf, a true Central Coast hidden gem. Designed in the tradition of classic courses like Cypress Point and Pebble Beach, the beautifully manicured course is fun for new golfers and skilled players alike. After your round of golf, retreat to your room at the Paso Robles Inn for a steak dinner and a rejuvenating soak in a deluxe hot spring mineral tub spa to give your Dad the rest & relaxation he truly deserves this Father’s Day.